I love the fact that we have a financial Literacy class. The children are learning how to write checks and balance their checkbooks. We are talking about Kindergarten-5th grade, and they are doing a great job. 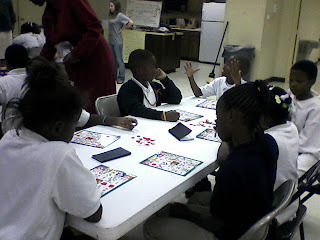 This is helping them brush up on thir math skills also. Ms. Janet taught the younger kids yesterday on how to add and take away when using their check registers. This new way fo discipline is working out very well. The children know that they can earn money(not real money) for good behavior or they can get money taken away if the make bad choices. If they get enough money they can purchase items from the ASA to use for the day, like: a camera, voice recorder or weekend back pack full of goodies. They love it ! Three have already bought either a camera or voice recorder. Now, the other kids are working very hard to earn enough to do the same. I wish that, when I was younger, some one would have taught me how to save and balance my money. I think that bringing this class into the ASA was a brilliant idea, with the way the economy is going by the children learning this now, it will profit them in the future. One of our upcoming fiels trips will be to WaMu, so that the children and their parents can open up their very own savings account. 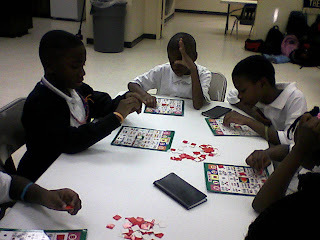 Today we had a good day with our Financial Literacy class 3rd-5th grade. 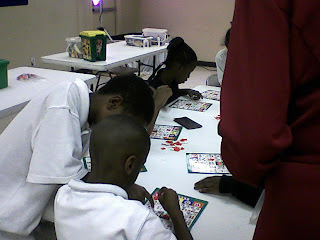 The kids had a great time playing BINGO with money. So for instance, they had to find B .15 cent. They had fun while learning how to count money. Though we still have some paperwork to do before it is official, the Dallas Housing Authority has graciously allowed us to have a WONDERFUL space that will be our own. In all of my years of working with kids, we have never had space that is brand new and solely our own to use. Knowing that we will now have this space is such an exciting time for us, filled with so many new possibilities! Yesterday, during a staff development meeting, I took the staff (Sylvia and our three Americorps members) down to the new space so we could begin envisioning how to decorate and what classes to have where. I was so excited when the staff walked in and I watched their eyes get big with excitement and immediately started throwing out ideas. Their energy made me so proud and pleased to have acquired these four as staff this year. Andricka (a senior at Skyline high school and first time Americorps member) couldn't believe she was going to have her own classroom for her Kinder-2nd grade kids. I kept chuckling as she continued to beg for a classroom of her own... "Please, can I have that classroom for my kids? (as she carefully choose a specific room for her class)" It took several times to convince her, "Yes, Andricka. That can be your classroom." "Really???" "Yes, Andricka. It's your classroom for your kids." She's already throwing around new ideas of how to decorate for her Voting and Elections class and figuring out how to implement her new Math class (after going to an amazing PBS math training we received through a grant). I love getting the right people on board. It makes all the difference in the world when people are excited about education, excited about learning, excited about teaching kids, and excited about working with parents. With Ms. Doris, Kristina, Andricka, and Ms. Sylvia, I know we have the right team! For the last four months, our After-School Academy has been in limbo. With staff cutbacks and the upcoming demolition of Turner Courts, it has been challenging to figure out how to transition to a new program in Roseland TownHomes. After growing a program for 8+ years, it's really hard to figure out how it all started and to replicate that. It's also hard because we and those around us expect us to start where we left off--with a full slate of 30 kids. On top of that, we have the challenge of figuring out how to restructure the program with less staff and uncertainty about a location. We did start, though. The Central Dallas Church was gracious enough to allow us in their facility for as long as we needed. We are partnering with J.W. Ray (thanks to Ms. Brenda Powers, Community Liaison) and have two chess club rotations (thanks to Carmen Chairez, Minority Business Development Association)--20-25 kids in the first class and 8-10 kids in the second class! Jennifer Africawala (CDM Americorps program) helped me figure out how to have 3 Americorps members instead of two...and Kristina Williams, Andricka Lindsay, and Doris Thomas are absolutely wonderful! Texas Capital Bank (Richard Mauldin) and United Central Bank (Cheryl Gilbert) provide finance classes for our elementary kids and we offer art classes through Theresa Cissell (another Americorps volunteer) and Catherine Hamrick (a Richland art major). And more people keep coming! Sylvia Baylor has been amazing as she has been so willing to step in to coordinate the program in our transition. It is because of her, as well as the help of Marva Epperson-Brown, Danielle Evans, and Kim Johnson (other CDM staff), that we now have 26 kids enrolled and are growing every day! It is also because of Sylvia that we will now have a reading teacher from J.W. 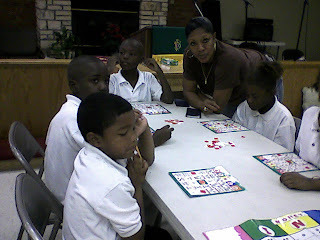 Ray Elementary volunteering with us once or twice a week! There are more partnerships that I'll tell about in future posts. For now, we are off to a great start!